The number of international students at Kwantlen Polytechnic University has increased remarkably over the past nine years, with 1,459 more students enrolled in 2015 than in 2006. This means that students from other parts of the world are pouring into the KPU community while domestic enrolment largely stagnates—and this isn’t just a theme at KPU. It can be easily observed in other parts of the province and country. Between 2008 and 2015, Canada saw a 92 per cent increase in the number of international students studying within its borders, with just over half of them planning to apply for their permanent residence. In 2012, the Canadian Bureau for International Education reported that the nation receives nearly $8 billion annually from international student expenditures such as tuition and living expenses, and that “the presence of international students created over 81,000 jobs and generated over $445 million in government revenue.” Those were the facts back in 2010, and it’s likely that the numbers have grown since then. Provincial interest in international students has boomed as well. Statistics Canada discovered that B.C. universities had the highest proportion of international students out of all of the provinces and territories in the country at 17.6 per cent. There is a reason for this steady and widespread increase, specifically in British Columbia, and it originates from a document that was released five years ago. B.C.’s International Education Strategy came out in 2012, mandating post-secondary institutions in the province to encourage overall enrolment, but focus on accepting international students. KPU responded to this by including it in its five-year vision plan, stating its goal of “enhancing internationalization to develop better understanding of global challenges and citizenship” as well as spiking overall enrolment. Now the university has blown through the provincial goal of 1,300 international students enrolled full-time and has been bringing in more international tuition every year. The concept of internationalization—or establishing products and services that can be easily adapted for people of various languages and cultures—is strongly tied to Canada’s ideals of diversity and multiculturalism. KPU is striving to be a proponent of those values partially by bringing in more international students. Despite the benefits both to international students and the environments that welcome them, there are often significant obstacles for foreign students hoping to begin their post-secondary education in Canada. For instance, each international student must meet KPU’s language requirements for English, which are the same for domestic students. If any KPU applicant is unable to meet that standard, they have the option of taking a series of language tests. The most popular option is the IELTS exam, which is broken down into english components such as speaking, listening, reading, and writing. An undergraduate student needs to achieve 6.5 on the IELTS test in order to be accepted at KPU—the same number demanded of UBC applicants. Even after international students meet the language requirements, they may still struggle with communicating and excelling in KPU as an unfamiliar environment. Mcllmoyle and Anderson-Fennell encourage students struggling with their Canadian education to utilise the university’s learning centres and enrol in a class called “Introduction to Higher Education for International Students” or EDUC 1150. “It addresses things such as how to succeed in Canada, study skills, understanding what plagiarism is in Canada—all of these things that, if you’re coming from a different culture, things might be quoted or done differently,” says Mcllmoyle. For international students hoping to get more involved with the university community, on-campus events such as March’s Holi celebration and information sessions are a great opportunity. KSA Faculty of Business Representative Arshdeep Singh Battu, who is from South Asia, encourages international students to get to know people, surround themselves with positivity, get involved in KPU culture, and enjoy the Canadian life. 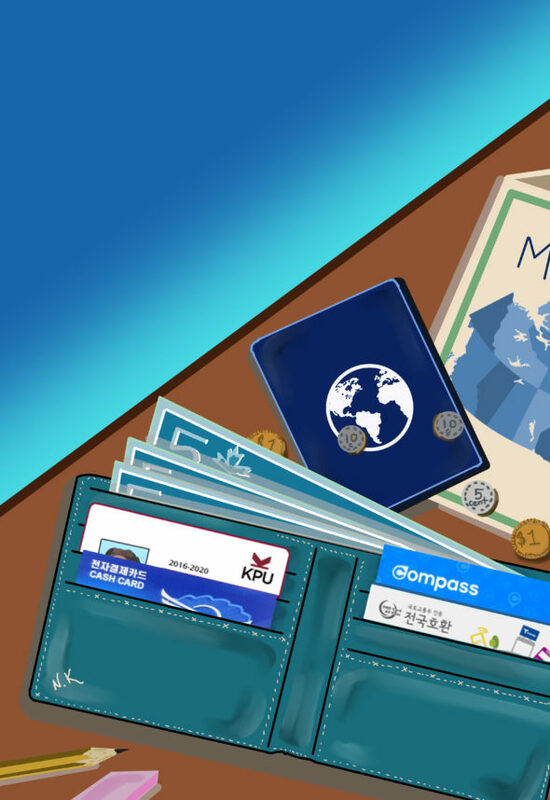 KPU International is also dedicated to helping their domestic students go international by studying abroad. For those that don’t have the time and money, Mcllmoyle believes they can get a taste of what it’s like by interacting with the international students who come to the Lower Mainland. This picture of international student enrolment, although honest, is also optimistic and doesn’t take into account the financial benefit of encouraging them to enrol at KPU. Although the university still makes far more off of domestic tuition, international tuition has increasingly been accounting for more and more of KPU’s revenue. Last year, KPU’s tuition revenue was 60 per cent domestic and 38 per cent international, compared to 73 and 24 per cent in 2014. Over the next year, international tuition revenue represented 27 per cent of all of KPU’s non-governmental revenue. Certainly, international students are charged more than domestic students for the same education. Navkaran Kahlon, ex-international student representative for the Kwantlen Student Association, feels that the fact that this two per cent cap on local students’ tuition increases is unfair to international students in the province. “There is a cap on local students’ tuition raises, which means that every semester there is a percentage above which the fees cannot be increased,” Kahlon told The Runner in November. “But for international students, there is no such cap. They can increase fees for international students any time, by any proportion. According to KPU’s website, international tuition for semester-based programs is $561.00 per credit, compared to the domestic rate of $136.30 per credit. With a typical class being worth three credits, it means that if you were born outside of Canada and are now enrolled in a class at KPU, you are likely paying nearly $1000 more to be sitting in that classroom than your Canadian-born peers. On top of that, an international student’s temporary insurance plan, which all KPU international students are enrolled in, is $220.00 per semester. In order to opt out of the plan they must provide proof of having provincial health care coverage, which comes in addition to the KSA’s extended dental and health care plan. Overcharging international students could be seen as unethical, but so could charging them the same amount as domestic students. If international student enrolment is already rising exponentially, taking down financial barriers to enrolment could mean domestic students end up losing seats in university classrooms to students from other countries. That poses a threat to Canadians who depend on post-secondary education to help them move forward in life, and a lack of space for students born and raised here is already a contentious issue at KPU. With the recent signing of the memorandum of understanding with Maple Leaf Education, KPU has agreed to invite Chinese high school students to use campus space for their studies as part of a three-year pilot project. “This is a way for us to start a positive precedent in working with other markets, and it definitely is a great opportunity,” said KPU Provost and VP Academic Sal Ferreras at a March meeting of the university’s Board of Governors. Ferreras largely headed the project, and was disappointed to see that many members of the community did not share his excitement for the future. Board of Governors Student Representative Eric Wirsching, Kwantlen Student Association President Tanvir Singh, and Faculty of Science and Horticulture Representative Suzanne Pearce all expressed concern about the project at the March meeting, and many others have echoed their complaints since. Letters from the KSA, the university’s Biology department, the Sustainable Agriculture Student Association, and the Kwantlen Faculty Association made similar statements. Nevertheless, the project was approved. If the university has gone too far with its efforts to attract international students—and their dollars—invested students, staff, and faculty will continue to make their voices heard. Yet it’s also crucial to appreciate the value and validity of students from all parts of the world coming to KPU to learn and grow, regardless of where they were raised. Whether you’re a domestic student looking to study abroad, an international student easing into your first KPU courses, or a Fraser Valley local criticizing the number of non-Canadians at your university, remember to be patient and accepting of those around you. KPU claims to be a small but close-knit multicultural community. Out university is a place to learn and connect with others, and there are plenty of support resources for those of us born here and abroad. Let’s work together to keep that reputation strong.